The TANK™ GT package turns the TANK™ into a complete sled training system that you can program group classes around. The package combines the TANK™ Mark 1 with our XTGAK group accessory kit. The kit includes two V-Strap Handles, two Padded Waist Harnesses with Tow Straps, two 1.5″ x 30′ Tow Ropes with Quick Attach Carabiners, two Combination Cable Locks, and a Waterproof Nylon Drawstring Bag. These combined features create a versatile piece of group training equipment that provides incredible savings. The GT package accessory kit allows you to utterly customize your sled weight training workout experience. Depending on which accessories you use, you can tailor your workout to address several different muscle groups at once for a full body workout. Perfect for group training, you can train alongside other athletes for that extra moral support. Something that resists the athlete's effort to accelerate and run faster is an exercise technology that has never existed before. Training with TANK™ provides a full body workout while increasing speed, acceleration, and explosive power. The faster you push, the harder it gets. 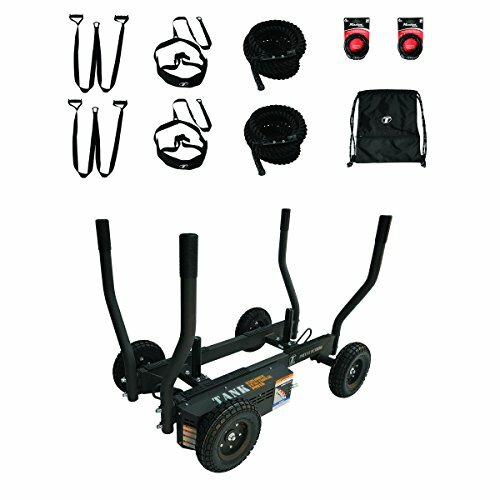 This bi-directional power sled on wheels utilizes a revolutionary magnetic resistance brake system that increases resistance the faster you push it. The brake system allows you train any level of athelete from pros to beginners. Used by professional teams in the NFL, NBA, MLB, NHL, and MLS to help them reach the top of their game. TANK™ is also used by seniors in the active aging community to rehab injuries and stay mobile. TANK's™ rubber wheels combined with its magnetic brake allow you to train on any surface, indoors or outdoors. Will not damage carpet, turf, wood floors, mondo, or rubber floors. Weight horns provide traction with added weight and tow hooks on either side allow for pulling and challenging battle rope exercises. Waterproof electrostatic paint coating on TANK™ allows it to be used outdoors without fear of damage from the elements. Backed up by a 10 year warranty and literally built like a tank, you don't have to worry about damage or wear and tear. The TANKTM GT package turns the TANKTM into a complete sled training system that you can program group classes around. Includes 1 TANKTM, 2 V-Strap Handles, 2 Padded Waist Harnesses with Tow Straps, 2 1.5" x 30' Tow Ropes with Quick Attach Carabineers, 2 Combination Cable Locks, and a Waterproof Nylon Drawstring Bag. TANKTM GT has a variable magnetic resistance brake that allows you to train multiple users by easily switching the level of resistance immediately. TANKTM GT's inflated soft wheels are gentle on carpeting, hardwood, and natural turf grass and tough enough to be used outdoors on concrete, gravel, grass, or dirt. Use the Group Training accessories for sprint harness training, rope tows, rope pulls, rows, harness backpedals, reverse lunges, lateral pulls, and more. If you have any questions about this product by Torque Fitness, contact us by completing and submitting the form below. If you are looking for a specif part number, please include it with your message.